Mint Chutney / Pudina Chutney is a spicy condiment prepared from fresh mint leaves, coriander leaves, ginger and green chilies. The lemon, peanuts and coriander leaves add flavor to this chutney. I made this mint chutney once a week, and it goes well with any sandwiches. Also, I serve this, along with samosas, vada pav, kachoris, as an appetizer. Plus, it is straightforward to make! You can use this mint chutney to marinate chicken and cook and serve this delicious chicken curry with rice! 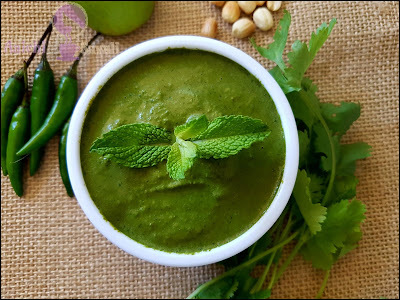 This mint chutney is also known as green chutney / Pudina Chutney / Hari Chutney, a fresh, cold and spicy dip made from fresh mint and cilantro, which pairs well with many dishes and even just dipped in crackers! Mint promotes digestion and soothes the stomach in case of indigestion or inflammation. It also a great appetizer. 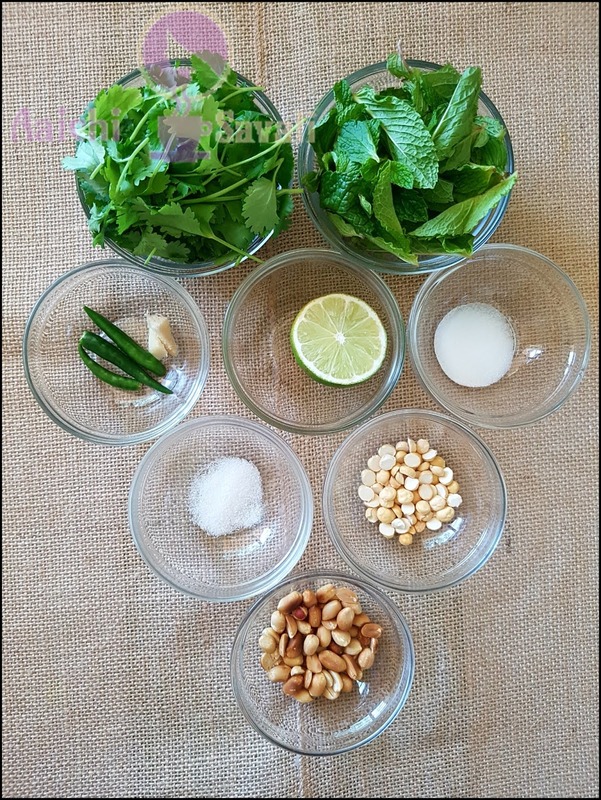 Mint has excellent curative properties and is considered an excellent home remedy for stomach ailments. 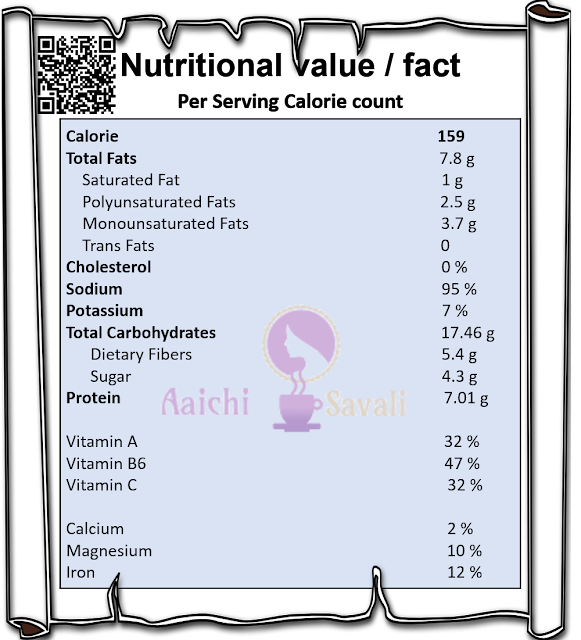 The whole serving of Mint Chutney contains 159 calories. 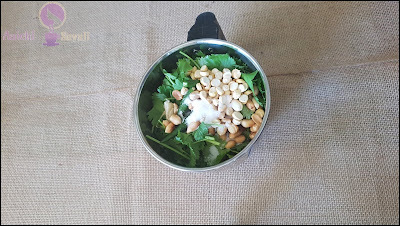 In a grinder add all the ingredients (coriander leaves, mint leaves, ginger, green chilies, peanuts, Chana Dal, sugar, salt and lemon juice) and grind to make a smooth paste using enough water. The whole serving contains 159 calories, along with carbohydrates - 17.46 g, dietary fibers - 5.4 g, fats - 7.8 g, proteins - 7.01 g.
Mint promotes digestion and soothes the stomach in case of indigestion or inflammation. It also a great appetizer. 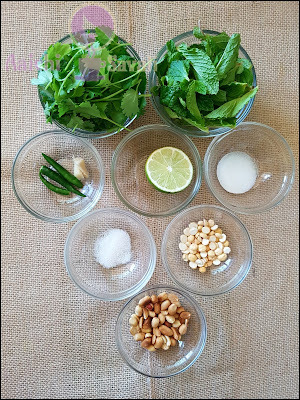 Mint has excellent curative properties and is considered an excellent home remedy for stomach ailments. Mint has germicidal qualities and quickly freshens breath, it adds to oral health by inhibiting harmful bacterial growth inside the mouth and by cleaning the tongue and teeth. It helps in weight loss by stimulating the digestive enzymes, that absorb nutrients from food and consume fat and turn it into usable energy.